the canDIshhh tales: Rockwell Primaries' 53 Benitez pops up in Megamall! Rockwell Primaries' 53 Benitez pops up in Megamall! I have been passing by Rockwell Primaries' 53 Benitez whenever we try and cut across the EDSA traffic coming from QC. The first thing that I noticed was the By Pass road they have on the corner of P.Tuazon and C.Benitez Street. I thought it was really nice, that they made this By Pass road for motorist. It somehow eases the intersection - I thought to myself that the people behind this property are actually very socially responsible because, let's be honest - creating this By Pass road will cut a portion of their property, plus - they won't be recognized by the government. Yet, they did this - to help ease the traffic. Condos are mushrooming almost everywhere. One thing I noticed though, is that most layouts are quite odd. I've seen the layout of a posh condo unit in Taguig and I was baffled at why the layout was not simple - it was confusing and it wasn't able to utilize the area PLUS there were exposed beams and oddly located posts. I assumed that all condos were like that - they had an odd layout. I first encountered a 53 Benitez pop up through the blogs of mommy friends. I thought it was brilliant because one will get a chance to see what an actual unit looks and feels like. I like the idea that you can walk through the set-up as if it was a real unit. Whoever thought of this - I swear - brilliant idea! I have never heard of any property giant doing a pop up (in a mall or another venue aside from their model units) to showcase the property. So when I got an invitation to see the pop up, I had to go and see it for myself! I was assisted by the very charming Joel. I was really impressed with what I saw. The layout was really neat, simple and very practical. There are no tiny nook and cranny - but instead wide spaces that can be utilized and enjoyed. To be honest, all of my assumptions on the layout of current condominium units were thrown out the door! Apparently there are still developers who make clean and simple layouts! Great job Rockwell Primaries! The walk through also helped me appreciate the pop up even more. I think that's the primary purpose of a pop-up and walk through, to make clients have a feel and be able to visual what its like inside the actual unit. I like that the furniture was kept simple - it makes you appreciate the space even more. 53 Benitez is a mid-rise development of Rockwell Primaries. It has 7 floors with 20 units on each floor. What's unique about it is that the mid-rise has what you call 'floating corridors' (see image below) this gives the home owners some breathing space. In the usual condominiums - I feel that the hallways are so cramped up so this is really something new (to me). It doesn't stop there - there's a private bridgeway that leads you to your home. It's very nice that one's needs is thought of instead of ignored. The people behind Rockwell Primaries really do their job in getting to know their clientele and takes into consideration what they may want and enjoy. The mid-rise enclave also has a swimming pool a fitness center, a clubhouse with function rooms and for the kids - a safe playground! They really thought of everything you know - even with the detail of where to hang your clothes after you've washed them! My SIL who lives in a condo air dries their clothes inside her unit - the reason, there is no space for that! At 53 Benitez, on the rooftop - each unit has a place where you can hang you clothes to dry - wonderful, right? 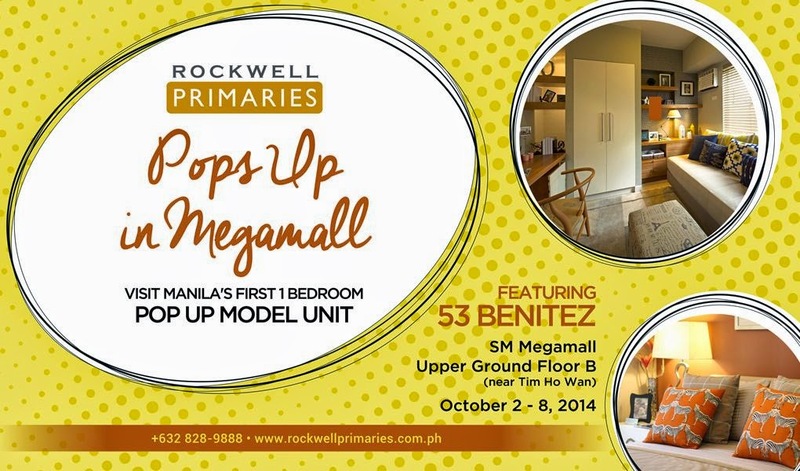 The 53 Benitez pop up in Megamall (Ground Floor of Building B) will be until October 8, if you have time - and is in the process of considering an investment or simply looking for a new home - please do visit the pop up and you get a feel of a Life Lived Better with Rockwell Primaries. Here's a short video of 53 Benitez, enjoy! Jollitown's The Big Fun Event at SMX!! The Urban Food Collective starts October 18!